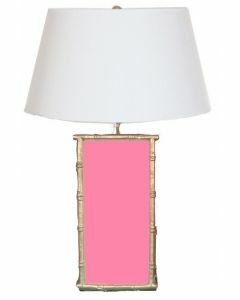 This lamp is a whole new take on tole with its ultra with its ultra chic pink "croc" finish. The cylinder base has a coordinating gold trim which adds to its overall posh appeal, perfect for achieving that Park Avenue panache. The lamp stands on 4 gold feet and measures 27"H. The lamp comes with a White or Black shade. Please choose the shade color from the drop down menu. Click on images for greater detail.